Melissa Hembree is a veteran in the music business. She has been recording and touring the United States since she was 9 years old. 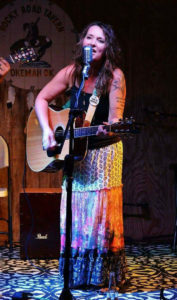 Championing the Oklahoma singer songwriter, Melissa hosts the popular Tuesday Tunes at Okemah’s Rocky Road Tavern. “Her self penned tunes are well crafted, well played, and sung from the depths of heart. A strong, powerful voice that speaks with full authority of a life lived with danger in the no passing zone.” – Rick Reiley, Corridor Magazine.